One of the most important foods to heal your gut and increase immunity is fermented foods. I am not talking about soy sauce and beer. I am talking about probiotic rich foods like sauerkraut, kombucha, miso, kefir, ginger bug sodas and in this recipe…fermented pickles. These fermented pickles add zing to a sandwich, flavor to homemade tarter sauce or taste yummy fresh out of a jar. 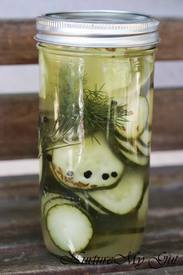 This is a great place to start if you are new to fermenting, you are sure to love these fermented pickles. They really are super easy to make!